Parent, B., Leclere, M., Lacube, S., Semenov, M.A., Welcker, C., Martre, P. and Tardieu, F. 2018. Maize yields over Europe may increase in spite of climate change, with an appropriate use of the genetic variability of flowering time. Proceedings of the National Academy of Sciences, USA 115: 10642-10647. Among the many shortcomings of model-based studies predicting future agricultural production is their near-universal failure to incorporate the ability of farmers to adapt by selecting different crop genotypes and/or adjusting management practices. Not surprisingly, by not allowing such realistic adaptive responses to occur, the models tend to predict future food shortages in response to warmer temperatures and less water availability associated with projections of future climate change. Hoping to interject a dose of reality into such models, Parent et al. (2018) recently combined experiments and process-based modeling to analyze future maize yields in Europe, while allowing for farmer adaption via genotypic selection and management practices (e.g., irrigation, sowing date, etc). In doing so they estimated yields in 2050 in response to two future greenhouse gas emission scenarios (IPCC representative concentration pathway (RCP) 4.5 and 8.5), comparing the future projections against baseline values for the period 1975-2010. The percent change in European maize production between the present-day baseline period and 2050 is shown in Figure 1. 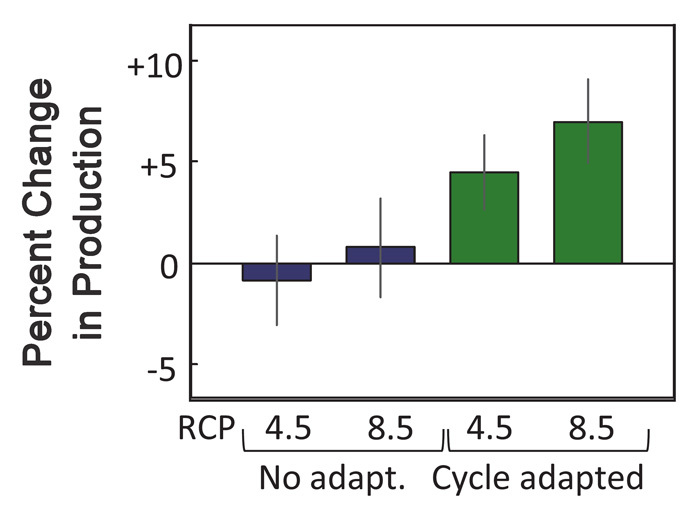 As indicated there, model results predicted stable (-1 to +1 percent) production values under both RCP scenarios when no farmer adaptation was allowed. In contrast, when permitting adaptation, European maize production increased between 4 and 7 percent. Still, the projected increase in maize production they report is likely significantly less than what will actually occur. Why? Because the authors admittedly failed to account for the productivity increases that will result from the CO2 fertilization effect of Earth's rising atmospheric CO2 concentration, considering instead that it is of no effect "because maize is a C4 species." However, as reported in our Plant Growth Database, such an assumption is false; the results of 54 experimental observations reveal a 300 ppm increase in atmospheric CO2 enhances maize biomass by an average of 27%. In light of the above, future projections of food production will be much closer to the mark if they account for farmer adaptation and the growth-enhancing effects of CO2 fertilization. And when they do, they paint a much more optimistic future of food security. Figure 1. Percent change in future maize production across Europe due to climate change under greenhouse gas representative concentration pathway (RCP) 4.5 and 8.5 both with (cycle adapted, green shading) and without (no adapt., dark blue shading) farmer adaptation. Error bars show the SE calculated over six GCMs utilized in the study. Source: Parent et al. (2018).